I have one AR pistol. It is a PSA PX-9 in 9mm. I purchased the the completed upper and lower separately. I added sights, optics, a brace and single poin sling (still looking for a light). It uses Glock mags. I am using a Kak brace, MBUIS and a red dot sight with a magnifier. It has the 10.5" barrel with M-lok handguard and a A2 style flash hider. My view on this? I'm a Glock guy so having an AR style weapon system that: allows for interchangeable mags (it will even accept G26 mags); increases the effectiveness of the 9mm round; has common AR controls (and attachments), as well as giving me a shoulder able brace. I wish I would have done this in lieu of a Sub-2000 (nothing against the S2K, it just didn't work for me). [*] General consensus on AR pistols? [*] Optimum barrel length & caliber? 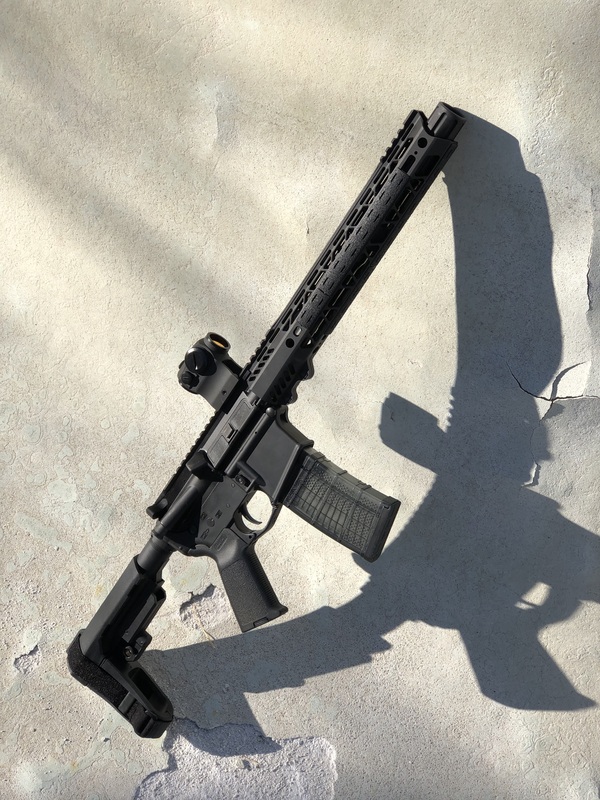 Is a 7" 300 blackout better than a 11.875" 223? [*] If the AR pistol is viable, who are some good companies to buy from? Or is it better to build one? -can carry loaded in a vehicle and falls under "CCW"
It wasnt until recently that the braces made them a truly viable defensive tool though. With a bare buffer tube I wouldnt even consider one. The original SB brace made them alot more useful but unless you are getting the KAK or SBa3 you are really compromising alot compared to a real rifle stock. My pistol has the SBa3 and I think that is as close as I can get to stying within the law and not feeling like I am compromising the feature set of the firearm. I prefer to keep my Ammo diversity low, so I chose a 10.5" 556 barrel. I really dont like buying special ammo just for one gun. Because 556/223 is already plentyful I get to shoot my shorty pistol as much as I shoot the longer carbines. My buddy has a 8" 556 pistol and it is noteably blastier than anything else. When NSW/Crane was trying to build a CQBR upper, they decided that 10.3" was the shortest you should go for 556. I always like to build my rifles over buying them, but PSA had way too good of a deal on a kit, that only needed a lower reciever to become a fully functional firearm. I have 400+ rounds throuhg it so far all trouble free. hitting ipsc steel at 300M isnt too hard. Have a friend who has killed many pigs with the 300 BO, it is a deadly round that shines in short barrels but is an expensive round. Another one has killed many with an 11.5 AR in 5.56. You loose a lot of performance with a 5.56 shorter barrel but ammo cost is roughly half plus you can use a 22 conversion in it. For me that was the reason not to stock another caliber and just go with 5.56. Palmetto had a 10.5 melonited I purchased a while back and have been happy so far. Just a few hundred rounds through it but no issues and very accurate. Use 55 gr Ballistic Tips in it. Just has an A2 flash hider and it is loud. Always keep Howard Leight Impact Sports with it. my suppress my AR pistols: 11.5" 223 to make it slightly more tolerable with ear protection (and to make hits past 150 yds), and 7.5" 300 subsonic to be able to shoot close in without muffs. When you're looking a braces be certain to opt for something with more vertical axis support, such as a Blade or SBA3. The cheek-weld style braces offer very little stability as your third point of contact. I have very little knowledge of AR pistol parts. Does the "brace" or blade in your picture require a different buffer tube? I.e. can I use a conventional carbine buffer tube? The SBA3 brace using a standard carbine receiver extension. Other pistol braces use the pistol RE and some braces use a proprietary RE. If you are in the market to buy a brace and haven't bought one before I recommend the SBA3. Thanks, I like that option. I already have standard carbine receiver extension in the parts box. LOL. oh well .. Thanks. All times are GMT -5. The time now is 15:24.